A high school student from southwest China has become an Internet sensation after submitting an essay written in oracle bone inscriptions in the recent university entrance examination. But his unorthodox answer sparked controversy among Chinese linguists and educationalists, Xinhua reported June 5. During the routine slog of grading examination papers, a group of teachers were stunned when they came across a composition, entitled Familiar, written entirely in ancient Chinese characters. The characters were of the sort discovered on tortoise shells and sheep bones used for divining in ancient times (hence the term "oracle bones"), and were so unfamiliar that the teachers had to call in a team of linguistic experts to help them grade the paper. But after reading a translation of the essay in modern characters, the grading committee gave the essay only an average mark, on the grounds that it had strayed from the assigned subject. Huang Ling, the student who wrote the essay, says he planned his coup in advance. "I didn't do it on the spur of the moment," the teenager from Nanshan Middle School in Mianyang City, Sichuan, told Xinhua. "I planned it very carefully. I wanted to grab the attention of the examiners." Pu Tichao, Huang's Chinese language and literature teacher, was incandescent when he heard the news and criticized Huang severely. But he had to acknowledge that, "it is not easy for a high school student to write an 800-character essay in oracle bone inscriptions in such a short time." Pu said Huang was very confident of his knowledge of ancient Chinese. "Out of the 1,000-odd oracle bone characters, Huang has mastered 700-800," he said. Niu Jing, Huang's class adviser, remained convinced that Huang acted on the spur of the moment like a typically impulsive teenager. "He comes from a rural family and his parents are away working in other cities all year round. He often used to pull these kinds of tricks in class". 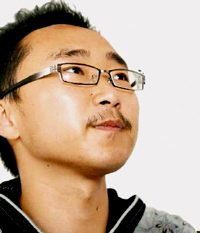 Not very tall, with glasses and a mustache, Huang is gentle and quiet in demeanor. "I started getting interested in oracle bone inscriptions in the second year of senior high," he explains. "My teacher, Pu Tichao, explained the development of Chinese characters from oracle bone to their modern forms and that helped me a lot." Huang Ling's essay set off a hot debate on the Internet, drawing both praise and criticism. Liu Zhao, a professor at the Department of Cultural Relics and Ancient Scripts, Shanghai Fudan University, praised Huang saying "[he] used many types of ancient Chinese characters in his composition, and most are correct." But a professor at the College of Journalism, Sichuan University, said exam rules should be tightened to ensure answers are written in simplified Chinese characters. Many netizens, however, were thrilled by Huang's essay. "Most children are only interested in getting good marks and show no interest in traditional culture. Students like Huang Ling are rare and precious," said one. Others were not convinced. "The university entrance examination has standards. If oracle bone characters are accepted we will end up with answers written in Martian," said another. Despite his poor final mark in the exam, there are reports that a number of universities have expressed an interest in enrolling Huang. But for Huang, it is all about his love for ancient oracle bone characters. "I'm determined to continue studying and researching in this field," he said. - No college for a top student?